Death Camas (Toxicoscordion nuttallii) of the Bunchflower (Melanthiaceae) family* is a white-flowered, poisonous spring ephemeral. The genus name is from Greek for “poisonous garlic”. The specific epithet honors Englishman Thomas Nuttall who, beginning early in the 19th century, published books on U.S. plants after exploring several areas of the country (including Arkansas). Death camas occurs in Arkansas, Texas, Oklahoma, Kansas, Missouri, and Louisiana, with reports also from Mississippi and Tennessee. 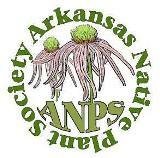 The only species in the genus reported from Arkansas, it is recorded from scattered Interior Highland counties between the northeastern and southwestern corners of the state. Habitats include mostly sunny, well-drained glades and prairies, rocky hillsides and woodlands. Other common names include Nuttall’s death camas, poison camas and white camas**. Death camas is a perennial monocot that develops bulbs. Bulbs are composed of fleshy concentric scales (leaf bases) that surround a reduced stem (basal plate) which produces fibrous roots below and vegetative growth above. The rounded-elongate bulbs, about 1 inch wide and 1½ inches long, have a thin dark brown to black exterior tunic layer that is composed of dried scales. Bulbs become dormant in late spring. Photo 1: As plants become dormant, leaves and stem dry and shrink away, leaving only the bulb to persist underground. Photo – early June. Leaves appear in late February as an upright pale green rosette surrounded by short white protective sheaths. Mature bulbs produce six to ten basal leaves, to 15+ inches long and about ¾ inch wide, which surround a single central flowering stem. The erect, unbranched, terete flowering stem grows 2 to 3 feet tall, with half its height attained during and after bloom as the stem continues to lengthen. Basal leaves are ascending and arching and, especially for lowermost leaves, recurve downward and back toward plant center. Medium green, low-sheen leaves are stout, thick and smooth (glabrous), widest at their base, with an equal blade-width most of their length, and a rounded apex. Leaves are firmly folded upward along the midrib, u-shaped in cross-section. Venation is parallel and leaf margins are entire. Photo 2: Death camas first appears as an erect rosette of leaves. Photo – late February. Basal leaves transition up the stem into a half dozen or so helically-alternate cauline leaves. Appearance and size of lowermost cauline leaves are similar to basal leaves, but those higher up-stem generally reduce in length, becoming straight and lance-like near the inflorescence. Lowermost cauline leaf bases have closed sheaths, fully enveloping the stem for an inch or more. Higher cauline leaves gradually lose these sheaths and become clasping, before transitioning to linear leaves with exaggerated lengths up to 12 inches. Uppermost cauline leaves transition into short floral bracts that subtend pedicels (flower stalks). Photo 3: Thick smooth basal leaves, u-shaped in cross-section, are erect to recurved. Cauline leaves have a similar appearance, but have a basal sheath or are clasping. Note exaggerated length of leaves (bracts) just below the inforescence. Photo – late April. The inflorescence of death camas, a raceme or panicle, initially appears as a somewhat elongate cluster of densely spaced buds. As blooming commences from the base, the inflorescence becomes conical to pyramidal as pedicels and rachis lengthen. With fruiting, the cylindrical cluster may become 12 inches long and 3 inches wide at its base and 2 inches at its distal end. In some situations, the single flower of a lower pedicel may be replaced by a small cluster of flowers. Pedicels, horizontal to slightly ascending, are light green, terete and glabrous, as is the rachis of the inflorescence, which can bear slight short ridges extending below floral bracts. Photo 4: Lowermost flowers are past anthesis while uppermost flowers remain in bud. Pedicels and rachis continue to grow as flowers bloom so that clusters become cylindrical. Photo – early May. Death camas may produce 50+ flowers in an inflorescence. The perfect (bisexual) flowers are up to ¾ inch across. Flowers have a perianth of 6 whitish to cream colored, thin ¼–inch-long, flared tepals with green bases. Tepals are oval to round with obtuse apexes and generally clawed (narrowed) bases. Tepals, flattened or cupped at distal ends, are in two whorls of 3; an outer whorl of sepals that are broader than the petals of the inner whorl. Six free-standing stamens, centered on the tepals, have slender straight filaments tipped with oblong anthers that produce bright yellow pollen. Filaments extend well above the perianth. A prominent, elongate, free-standing ovary is composed of three broadly-ridged cylindrical chambers, joined along a central axis. The apex of each chamber tapers to a long style that ends with a small flat-tipped stigma. In bud, styles are wound together, but with anthesis they curve outward and over the three outer tepals. Photo 5: The three outer tepals (sepals) are wider and cupped as compared to the three inner tepals (petals). Flowers have three styles that flare outward as flowers mature. With fertilization, the ovary produces a lobed, three-chambered capsule, ½ inch long and ¼ inch wide. Sepals and filaments are persistent on the dry tannish capsules as chambers split (dehisce) lengthwise to disperse seeds. Each chamber has about a dozen seeds in two stacks. The dark brown to black seeds are irregularly shaped with rounded faces and flat sides. Photo 6: In late June, plant has become dormant and seed capsules have dried. In a native plant garden, death camas can be a low maintenance ephemeral that fits nicely in a bit of empty space. With its early graceful foliage and inflorescence, the plant can be eye-catching before a garden is dominated by taller more leafy plants. The plant is highly toxic so it must not be planted where edible bulbs (such as onion or garlic) might be harvested for food. Previously classified as Zigadenus nuttallii of the Lily (Liliaceae) family, this plant was reclassified based on the family’s evolutionary history. ** Common names that include “camas” relate to species in the genus Camassia such as great white camas (C. leichtlinii), a native species of far-western states. Arkansas Camassia are called wild hyacinth (C. scilloides) and prairie wild hyacinth (C. angusta), both with blue flowers. This entry was posted in Know Your Natives, Native Plants, Wildflowers and tagged Death Camas, Melanthiaceae, Toxicoscordion, Toxicoscordion nuttallii. Bookmark the permalink.